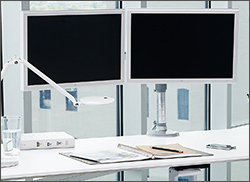 M/Flex, Humanscale’s multi-monitor arm system, can go from one to six monitors in minutes without the need for tools. 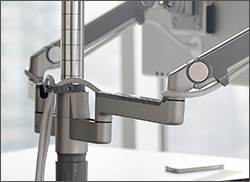 Seamlessly integrating with any work surface through a wide number of attachments on a single post, M/Flex turns any standard work surface into a dynamic workstation. Unlike conventional monitor arm systems, M/Flex has a small footprint and its aesthetic won’t overpower the existing workspace. Its modular design and strength allow exceptional performance for a multi-monitor system. As monitors continue to evolve, M/Flex’s versatility makes it the perfect multi-monitor solution for a changing technology landscape. The M/Flex allows the user to work in a healthy posture by setting the monitor at an optimal distance and height, collaborate easier through effortless screen sharing, and increase desk space. The most scalable system on the market, M/Flex allows users to easily reconfigure it as they need by adding or removing monitors. The M/Flex multi-monitor arm system allows the user to simply swap attachments to suit their changing technology needs while retaining a sleek, minimal aesthetic. Manufactured primarily from recycled aluminum, M/Flex is as recyclable as it is beautiful. M/Flex offers the most versatile, modular multi-monitor system available. By lifting up to six monitors up to 20 pounds each off the work surface, M/Flex frees up valuable desk space for a clutter-free workspace, helping to preserve the existing office aesthetics. 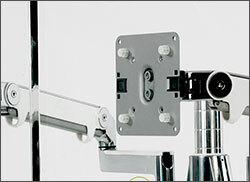 M/Flex’s removable 180-degree stop also protects walls and panels. M/Flex offers effortless adjustment and enables easy, spontaneous configurations. 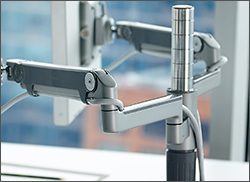 With its plug-and-play customization, M/Flex allows users to add monitor arms, attachments and accessories as needed. Additions can be made without the need to remove existing brackets or installations, making M/Flex the perfect addition to the modern and constantly evolving workspace. M/Flex was designed by the Humanscale Design Studio to be the world’s most flexible and scalable multi-monitor arm system. The team wanted to make a system that was simple to alter, easy to install and expand and that meets the changing technological demands of workspaces.